A barometer which utilizes an aneroid capsule. Also known as aneroid. An instrument that measures the atmospheric pressure. It consists of a cylindrical vacuum chamber with corrugated tops and sides. A system of springs within the chamber prevents the chamber from collapsing as a result of outside air pressure. 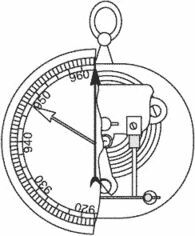 A pointer through a suitable gearing indicates the expansion and contraction of the aneroid, according to the atmospheric pressure. Also known as a siphon chamber. The example shown here is one of these banjo aneroid barometers, dating to the late 19th/early 20th century. Their website boasts of "an incredible variety of weather predictors, from conventional mercury and aneroid barometers.